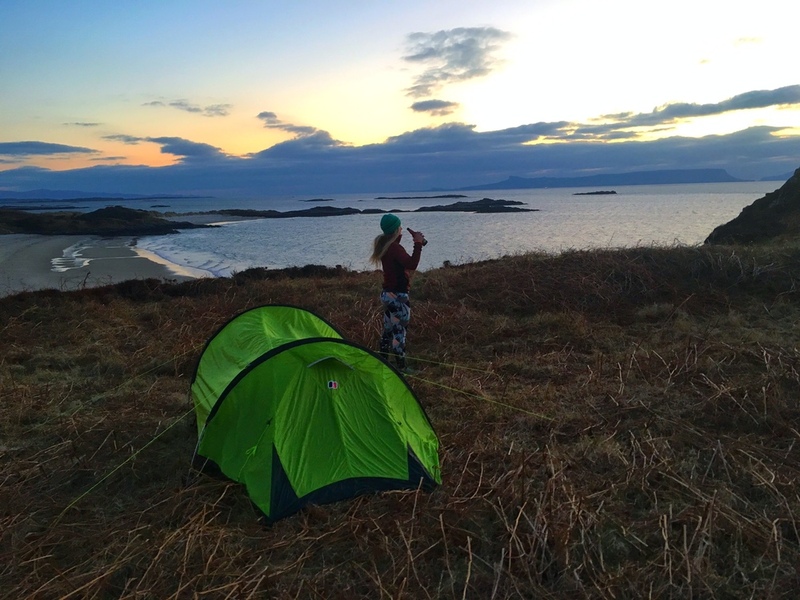 Scotland has the right to roam act which means it’s legal to wild camp any where. 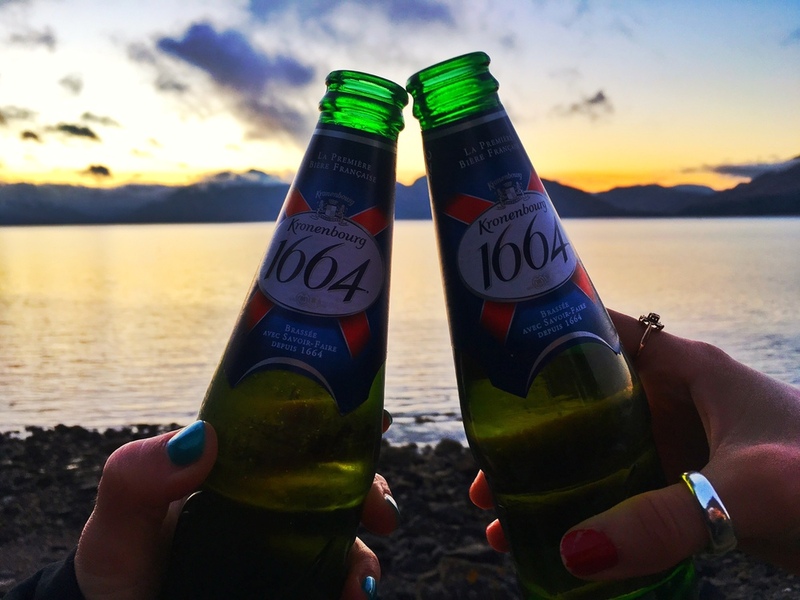 After Lorna and I finish our run on Ben Nevis, we drive towards Mallaig on the West Coast after a recommendation from a friend as a spectacular place. We don’t know exactly what we’re looking for, but have an idea in mind and our eyes peeled. We pass a small car park with a sign “Path to Beach” pointing to a cliff top. We park up and unload the car. We’ve found our spot. The sun is low in the sky which means we have to make tracks to get the tent up so we can crack open the beers and watch the sun go down. Across the sea from our perch is the Isle of Skye, bathed in a glorious shard of light streaking out of the clouds. We know when that light becomes covered by the clouds, that will be it but we don’t want this day to end. A few hours ago we were running in the snow on the cloud-shrouded Ben Nevis. Now we were sitting on a sandy hilltop overlooking the sea. After sundown, we dress our tent with LED fairy lights, put on an extra layer and set about making dinner. After our 25km run on the WHW yesterday and 7km today this is our chance to refuel our tired bodies. Cous-cous, chorizo and cheese is on the menu washed down with local ale. Delich. In bed by 9pm we crack open the hip flask for a nip of whisky, share a few squares of chocolate and continue sharing stories until we fall asleep. Having met Lorna just under a year ago, I never imagined we’d be wild camping on a deserted cliff top over looking the Silver Sands Beach in Scotland. There are a million things I never imagine happening. Yet they do. There’s magic and energy in every idea, conversation, thought, or person we meet and the connections we build. At the heart of it all is creativity. Lorna and I discuss our inspirations for creative living and how we sustain them against the pressures of building a business and earning a living in a less than conventional way. In the morning, we make bacon sandwiches, drink tea and pack up the tent. We leave without a trace. Armed with treasured memories, appreciation for silence and stronger friendship, we say goodbye to Scotland and head back to our lives in the city. On the way back we find a few spots to sit and bask in silence once more. The reflections, the sounds of water moving, the realisation that within a few hours we'll be making the long journey back to London. We soak up every last ounce of wilderness we can get. With thanks to Caledonian Sleeper, JeepUK and Blacks.